Abdominal Aortic Aneurysm (triple-A) is an abnormal localized dilatation of the abdominal aortic wall. Classification is made according to the relation to kidneys (more precisely to renal arteries). The majority of aortic aneurysms are located under the level of kidneys and they are called infrarenal aneurysms. When aneurysms are located at the level of kidneys and above, they are called pararenal and suprarenal, respectively. The size of the aneurysm and presence of the symptoms decides the treatment options. Aortic dilation of more than 50% of normal diameter (>3 cm) is considered as aneurysm. When abdominal aneurysm exceeds 5.5 cm, and when it is symptomatic, surgical treatment is recommended. Abdominal aortic endoprosthesis, CT scan, original aneurysm marked in blue. 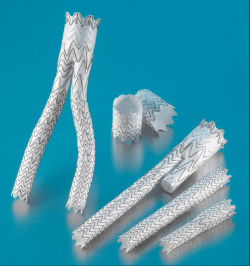 An endoluminal stent graft is a tube composed of material supported by a metal mesh which is called a stent. 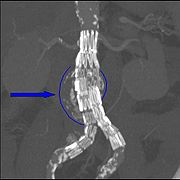 Endoluminal stenting (“inside the blood vessel”) can be used for a variety of conditions of the blood vessels, but most commonly is used for treatment of aneurysms. The role of the graft is to support the artery where there is a dilatation of the wall in order to prevent a rupture in cases of aneurysm. When the graft is placed, it supports the weakened part of the aorta and allows normal flow of the blood. Interventional radiologist inserts catheter through a small incision in artery or vein (usually in the groin), guiding them via continuous X-ray monitoring, to the place where the stent needs to be located. When the stent has been positioned and released, it expands and seals with the aortic wall below and above the aneurysm, releasing the pressure on the actual aneurysm. The catheter is then removed.